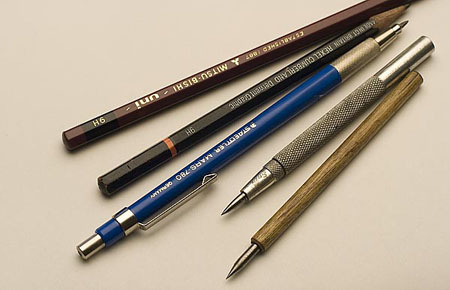 9H pencils, a mechanical pencil with 9H lead, and scribers used for layout. For precise layouts on metal, I use a carbide scriber with rounded point. Carbide scribers are readily available from a number of sources, and easily modified to become the perfect scriber. I prefer a slow taper to my scriber point, and regrind commercially made scribers so I can easily see the tip as I'm drawing under the microscope. After you've tapered to your liking, sharpen the scriber to a fine, needle point on the Powerhone with a 260 grit diamond lap. 260 is sufficient for sharpening, but I usually take mine all the way to 1200 for a super smooth finish, followed by polishing on a piece of leather treated with diamond spray (I can then use the sides of the scriber as a burnisher). Next, very carefully round the needle point on the ceramic lap. The rounded point can then be polished on a piece of leather treated with diamond spray. Be careful with the rounding of the point as it's very easy to remove too much material. The object is to have a very sharp scriber with a small radius tip, not a wide, rounded tip. Smaller points are easier to see around under the scope, and allow extremely precise layouts. BENEFITS: The rounded tip scriber will allow you to draw in any direction on metal, much as you would with a ballpoint pen. The scribed line is not scratched into the metal, but lightly burnished. In my travels I can't tell you how many times a student or visitor has watched me scribe a layout, and then pick up my scriber and closely examine it with a bewildering look, and then ask where they can buy one. Give it a try, and I'm sure you'll be pleased with the results. My friend Jason Marchiafava makes his scribers from sewing machine needles as above, and puts them into a mechanical pencil! When not in use, the scriber slides back into the pencil for protection. He also uses the side of the scriber as a burnisher. Thanks, Jason! Speaking of precise layouts, sharpening a 9H pencil to a needle point will result in extremely fine lines, and the super-hard 9H will stay sharp longer than softer lead pencils. Spin the pencil in your fingers as you sweep it across a piece of 320 or 400-grit sandpaper. PROS: Razor sharp layout lines. Stays sharp. MasterGraphics has lead holders and 9H leads.